Click here to see the full-size sarcasm--I MEAN--comic strip. Really, the punchline is in the first line of dialog, isn't it? Why do bosses act like this? Do they honestly think that it's OK for THEM to do it because they're different from all the other jerky bosses that act this way? BALLPOINT ADVENTURES for 4/27/15: We Should All Trust the Guy in the White House! Click here to trust the president too much--I MEAN--to see the full-size comic. Anyone else think we're giving this guy a bit too much leeway? Like with the Drone War and with the TPP and a few other things? Anyone? 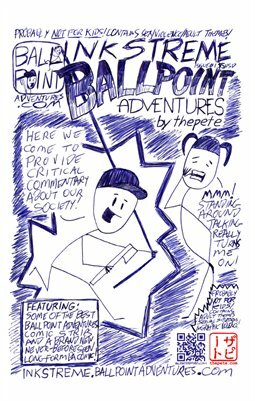 BALLPOINT ADVENTURES CLASSIC from 1/4/98: Barbie Should be Careful What She Wishes for! Click here to see the full-size violence against women--I MEAN--the full-size image. Sexism! Alive and well in the modern world (even in the Western World!). I think my original point, back in 1999, was: "Haha, stupid woman didn't choose her words well!" but now, 17 years later in 2015, I look a bit deeper and see this as a rough metaphor for what happens when women speak up for themselves. Be ready for the consequences of speaking up. I'm not trying to discourage women at all. I'm just saying that your freedom of speech can often cost you--so get help--financial, emotional, spiritual, whatever kind you think you'll need when the ridiculously patriarchal society we live in goes for revenge. And it WILL go for revenge--even unconsciously. Click here to enlarge the awkward silence--I MEAN--the image. Sometimes, humor is best when properly placed. BALLPOINT ADVENTURES CLASSIC from 12/28/98: BIlly loves to "read." Click to see the fully-engorged--I MEAN the full-size image. Always pleased when the style in which something is drawn helps comment on something in society. BALLPOINT ADVENTURES for 4/13/15: Bunny Man vs. Billy Ballpoint! FIGHT. Click here to see the full-size discrimination. Click to have your money kept from you--I MEAN--to see the full-size image. Technology is great, until it isn't. Click to see the full-sized unfair judgement--I MEAN--image. Because, people who discriminate really are getting desperate to find new ways to do it. Click to see the full-sized truth--I MEAN--image. Have you ever questioned your own programming?